I am looking at so many things these days, busy working, embroidering and sewing, and yet I want to add new material to my blog. Today will be a quick and easy posting. Austria is a country which is very rich in living costume and embroidery. Cross-stitch has been done here since at least the 1500's. 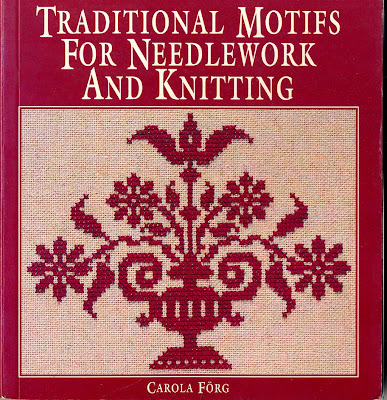 We have copies of pattern books which were published in that era, and many of the designs are still used today. 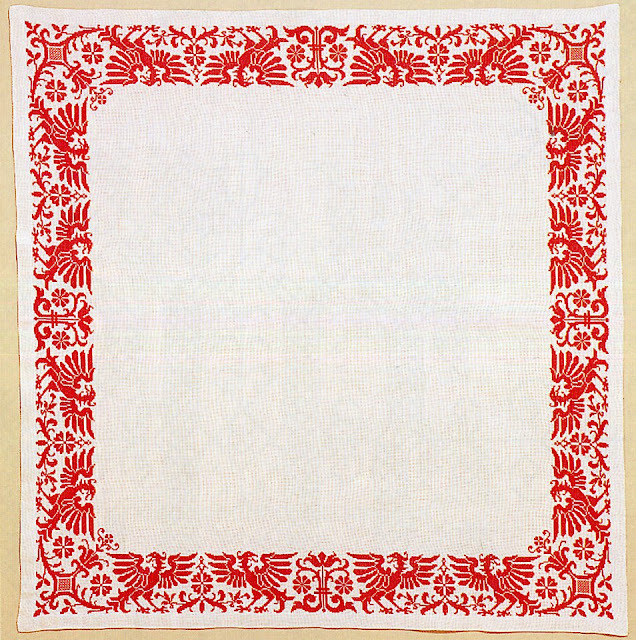 In Austria, as in most places in Europe, Many household linens were embroidered, and many people still carry on this tradition. 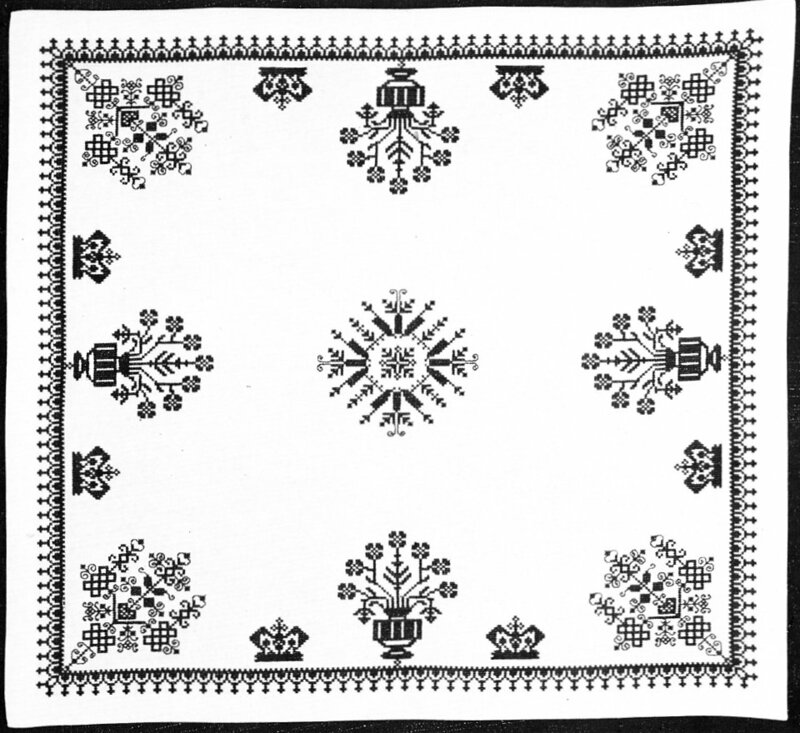 Decorative pillows [polster], runners [lauefer], and scarves for furniture, covers for breadbaskets [korbdecke], tablecloths [tischdecke], etc. 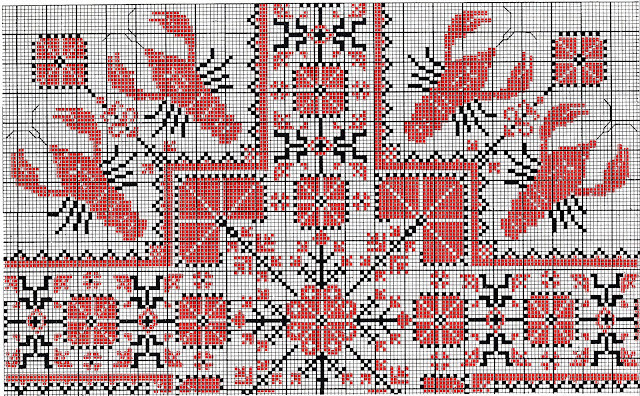 Many of these are done in cross-stitch, often with portions of the design executed in Holbein or outline stitch. I will focus today on one particular composition which is popular in Austria and rare otherwise, the Kreuzdecke, or 'cross-cover'. 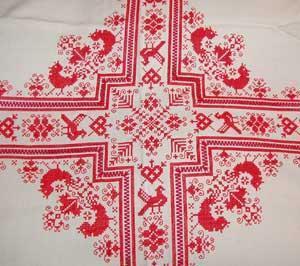 Many people embroider tablecloths, and usually they embroider a border around the outside edge. The Austrians also do this. Here is a typical example with eagles and flowers. Center and corner designs are often added in the middle, as many other people also do. Here is a small tablecloth with a multitude of designs along the outside border and one in the center. 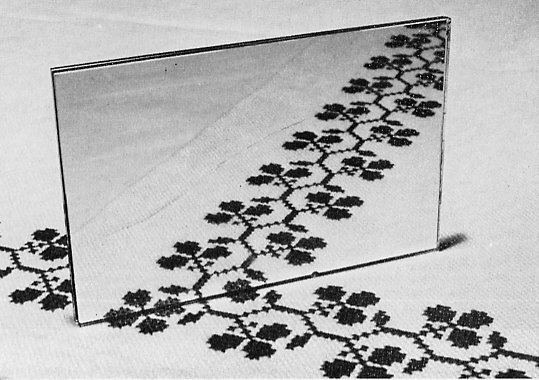 This image is in black and white, but the embroidery is in red. Black, Maroon or dark Blue may also be used. 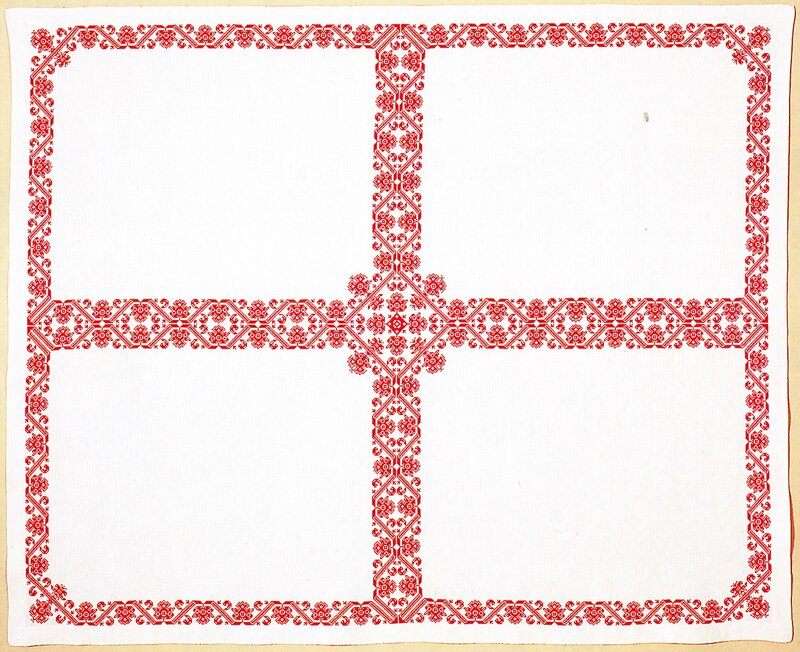 What seems to be unique to Austria is embroidering a cross-shaped design covering the center. At the top of the article is a closeup of the center of one of these tablecloths. Here is a view of the whole thing. This piece was embroidered in 1876 and forms part of the collection of the Museum Joanneum in Trautenfels Castle in Steiermark. 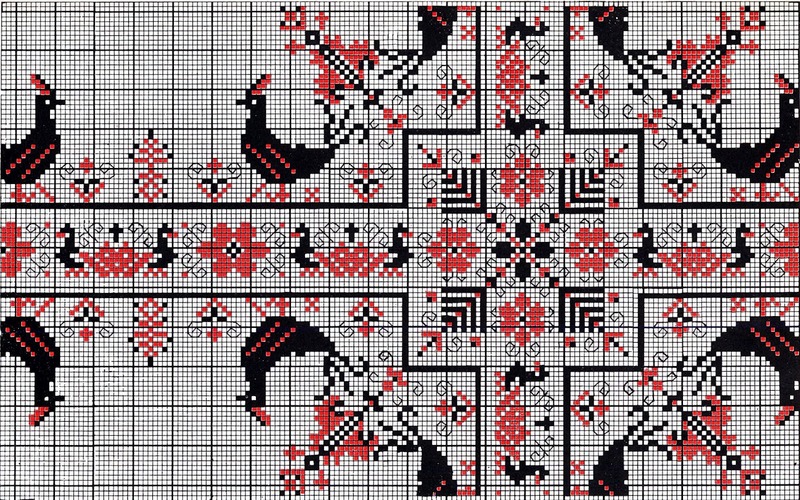 This design features the very typical motifs of hops, carnations, hearts and acorns in a striking composition. 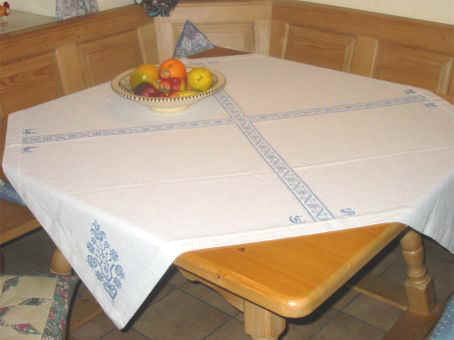 Such cloths are still in use in many Austrian households. Here is a family on an 'Ausflug', a sort of formal Picnic, just outside Vienna. This picture was taken in the 1960's. They have laid a tablecloth on the grass which was embroidered in 1905. 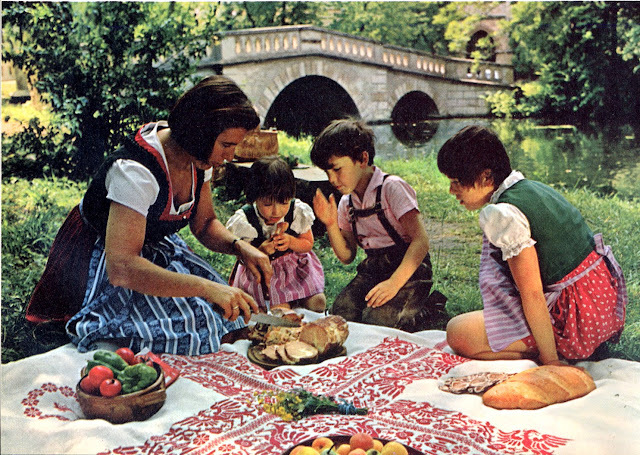 It is not uncommon to see Dirndles and Lederhosen worn in Austria. There are department stores where you can buy them off the rack. You can see that this design is similar to the one shown above, with eagles and flowers. 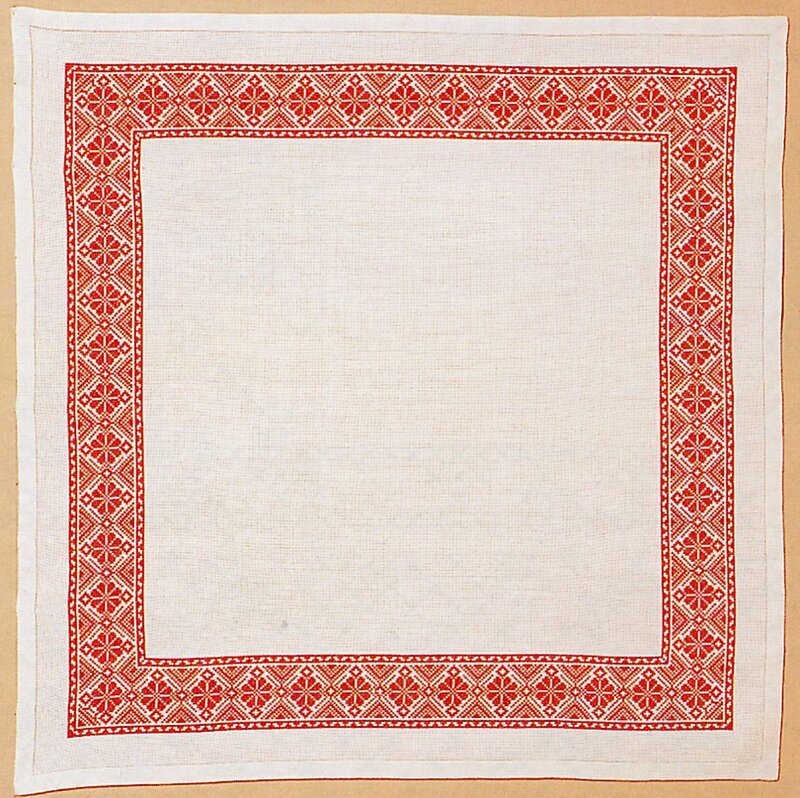 Here is the design used on this tablecloth, although I believe that the outside motifs are not on the cloth. You will notice that there is no outside border on this particular tablecloth. Any border design can be used to make a Kreuzdecke. Here is an example in which a border design with corners was repeated four times on a tablecloth to make a Kreuzdecke. You will notice that on the cross, the border design is doubled. 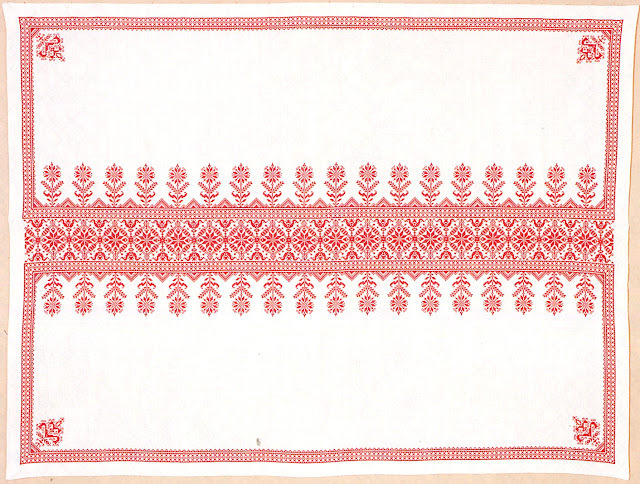 The center of the cloth was elaborated using motifs from the design. You will also notice that the outside corners differ from the corners where the border enters the cross. This is a very good example of someone taking a relatively simple design and elaborating a larger composition from it. 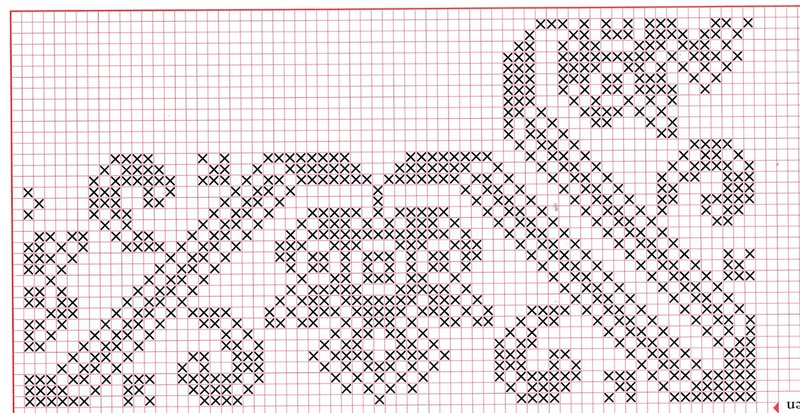 Note that when doing cross-stitch, the thread used should be heavy enough that each stitch makes a square. This then acts as a pixel which can be used to build up a design. The thread should not be thin enough that the stitch resembles an X. The stitches should also not have any space between them. This concept of the Kreuzdecke may possibly have come from the habit of embroidering covers for Easter Baskets. In Central and Eastern Europe it is the custom to take some of the food which is prepared for Easter Breakfast to Church to have it blessed after the Easter Morning service. This is done in Russia, Greece, Poland and everyplace in between and is also done in Austria. Included in the basket are lamb or ham, sausages, cheese, rich breads, eggs, butter, and other foods which were abstained from during Lent. This is what goes into a proper Easter Basket. These baskets are covered with an embroidered cloth. Sometimes it is just a cloth as would be used for a breadbasket. This example uses a geometric design which could have been done almost anywhere in Europe. 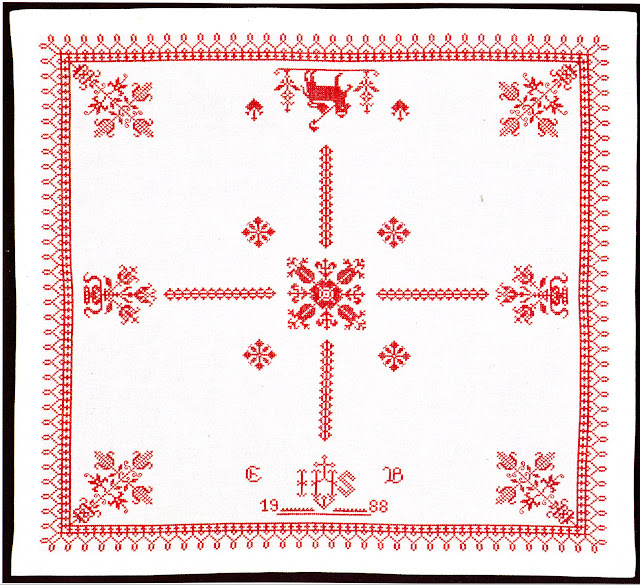 But sometimes explicitly religious symbols are included, as in this example of a 'Weihkorbdecke'. There is a central cross design, the Lamb of God, IHS incorporating a cross and a crown, hearts, and as is typical of Western Europe, the year of embroidering and the initials of the embroiderer. It is easy to imagine this basic composition expanded for a tablecloth. Here are a few more examples of Austrian Kreuzdecke and their designs. 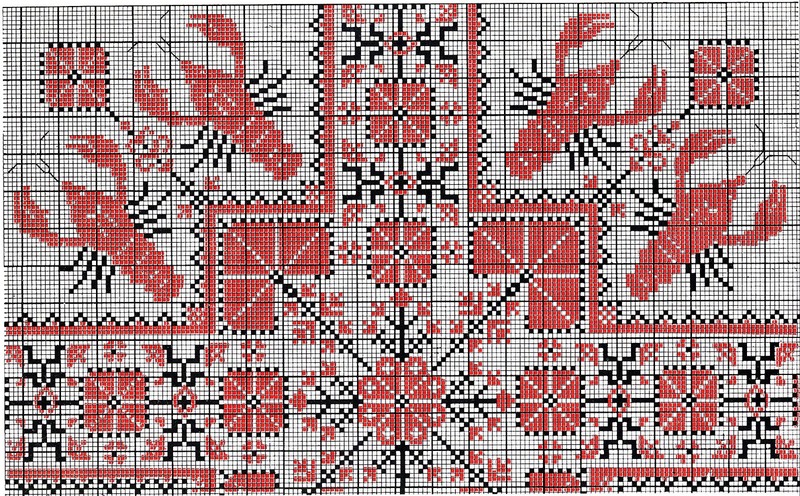 Here is a playful design with crayfish. Here we have chickens, I remember I once copied this design, but I changed half the Roosters into Hens. Here is a variant of the same design. Someone took the same basic concept and elaborated their own version of it. Here is an example of a fad which has been common for a few years now, of replacing a design of black and red or blue and red with light and dark blue. I admit that I don't like it, but it is popular. 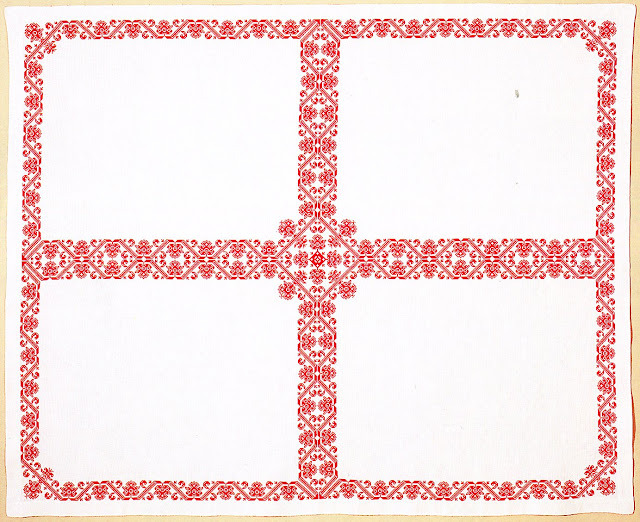 Here we have the cross, and corner designs, but again there is no outer border. 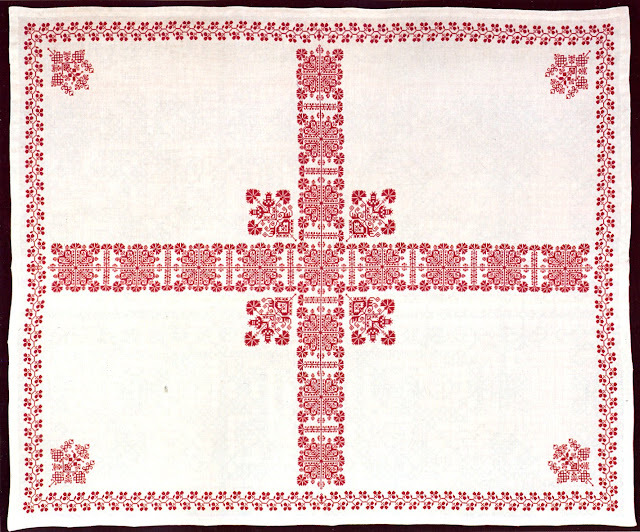 This tablecloth is not a kreuzdecke, but can arguably be considered a variant. In any case, it is a beautiful piece. Any border design can be used to make a Kreuzdecke. You may have to use some imagination and rearrange motifs to make a center or corner, or double the design, or do a mirror image of it. Feel free to do so. An easy way to design a corner is to use a hand-held mirror, and move it around to different parts of the border design until you find an effect that you like. 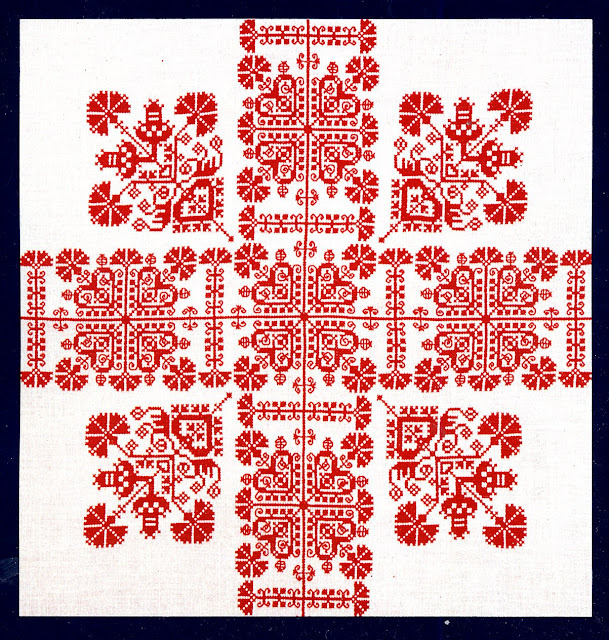 A very good source for designs, mostly from Central and Western Europe is this book. This is a reprint of a book which originally came out in 1878, but many of the designs go back to the 15th cent or earlier. It consists of a short introduction and page after page of graphed designs. No space is wasted on step-by-step explanations of other people's projects. The provenance of the individual designs is not given, which is unfortunate, but I still highly recommend this book as a source of designs. Take motifs or designs from here or elsewhere, plan, design, and execute your own project. Make something of beauty to use in your life, or to give to someone else to beautify their lives. This is my first time, but not the last time, to your blog. 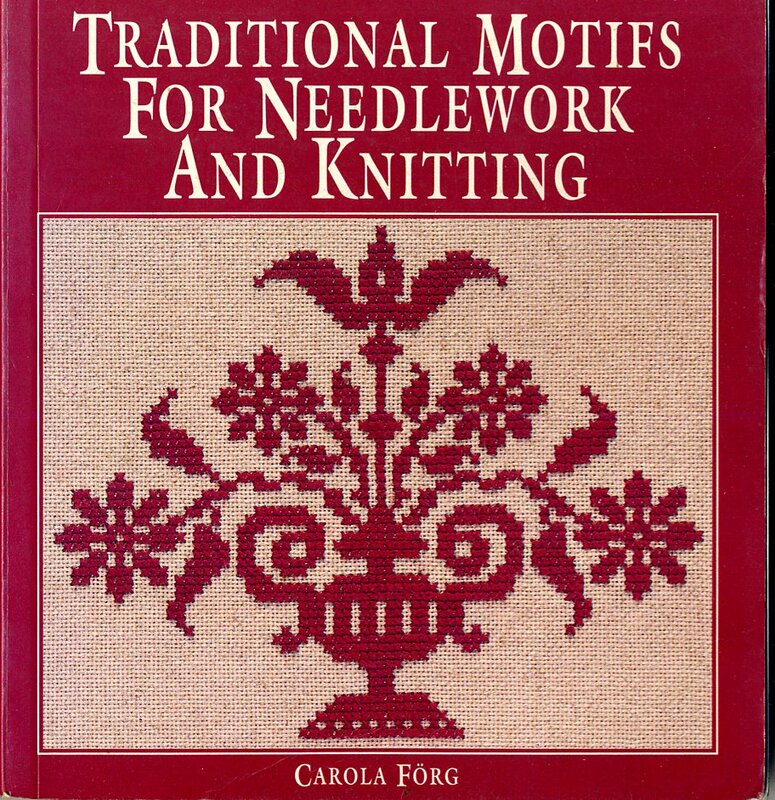 It was very fascinating and brought back many memories of my own needlework. Just might pick up my needle and thread once again. These are beautiful! 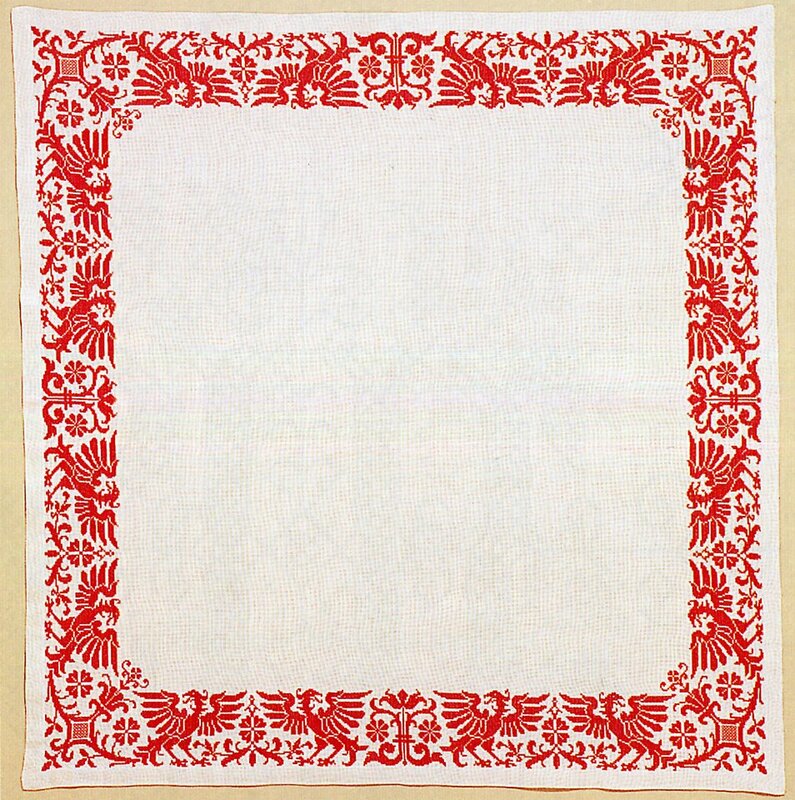 What is the best type of cloth to purchase to make a basket cover or tablecloth? Can even a beginner use linen? Thanks! Yes, linen is good, it has a very nice body to it. 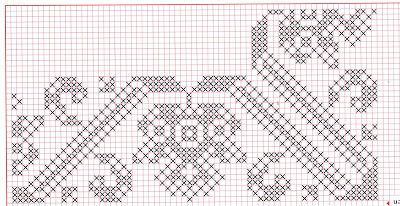 It has to be an even-weave, remember that each cross stitch goes over two or more threads in each direction. quaker cloth, jobelin, lugano or any other even weave cloth will also work. If using a lighter weight cloth, just be careful not to pull the stitches too tightly, they should lie flat and not pucker the cloth. Good luck to you. hello...i am an artist and i need to ask you a few things..can you give me your email address?